Last Minute Update :: Immediately before publication of this edition of the Québécois Libre, Kory Teneycke announced that he was stepping down as vice-president of business development at Quebecor Media. He explained his decision by stating, "It is my hope that my departure will hit the reset button, lower the temperature and allow a more rational debate over the television license for Sun TV news to occur, one not tainted by politics and controversies of the past month." It is unclear whether Teneycke's departure will have its intended effect, as he has been replaced by Luc Lavoie, a former spokesman for ex-Progressive-Conservative prime minister Brian Mulroney. A.A. Ever since Quebecor announced on June 15 that it was planning on launching a new, “Hard News/Straight Talk” TV station dubbed “Sun TV News,” the proposal has been under attack from various quarters. 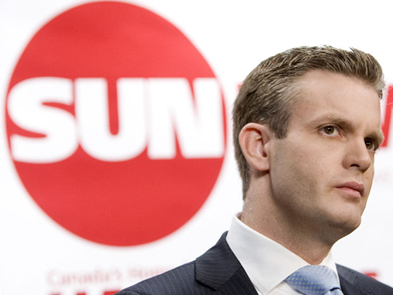 With Kory Teneycke – the former communications director to Stephen Harper – as the public face of the new station, it is widely assumed that the channel will be overtly conservative in nature. Even before the official announcement, the rumoured proposal was described as “Fox News North” (probably not meant as a term of endearment). So why are some people worked up about Sun TV News? Well, it’s clear that they don’t like Stephen Harper, they don’t like hate speech and they really don’t like Fox News. The Prime Minister is said to be conspiring to bring a soapbox for bigots – one modelled on Fox’s news channel – to the Great White North. I Just Don’t Like It! “Prime Minister Harper is trying to push American-style hate media onto our airwaves, and make us all pay for it. The claim about funding appears to refer to the type of license Sun TV News applied for, which I’ll discuss later. But the point is that the petition labelled the new channel a “nightmare” and apparently 80,000 people or so agree, although Teneycke claims that number is inflated. It’s unclear how you substantiate an accusation of hate speech against a channel that has yet to air a minute of programming. But what about the assertion that Sun TV News will really just be Fox News with Canadian content? Do the critics have a smoking gun? So, in 2009 Rupert Murdoch had lunch with Stephen Harper and an aide who later ended up working at Quebecor (after a brief stint at the CBC). Sure, no one knows what was discussed over lunch, but if the men broke bread together, that’s enough proof for, among others, Margaret Atwood. The petition then cites statements made on Fox News as evidence that Sun TV News will be filled with hate speech. The term “guilt by association” springs to mind. Another example of this kind of argument came in the form of a Toronto Star column, authored by Heather Mallick, headlined “Fox News North is a rancid idea.” Mallick explains that Fox News is a “privately owned propaganda channel” that “celebrates ignorance and fosters hate… It’s a poison tree.” She tells of receiving physical threats from Fox’s viewers after her appearance on Bill O’Reilly’s show. Strong stuff, but what does this have to do with Sun TV News? Halfway through the piece, she mentions that “there is no corporate connection between Fox and Sun.” Instead, the link is “visceral”: that same 2009 lunch. Mallick holds an M.A. from the University of Toronto. If she served as a teaching assistant, what grade would she have assigned a student whose entire argument rested on such a shaky foundation? The petition alludes to a second argument against Sun TV News: it would be funded by “money from our cable TV fees.” That certainly sounds ominous and illegitimate – why should we all be forced to pay for something we may not even want? How can they even do that? The answer, as far as I can tell, is that they can’t. Quebecor applied for Sun TV News to receive a “Category 1” license, and the CRTC rejected the application (having announced in March that it would not even consider such applications until October 2011). (See the CRTC’s letter to Quebecor.) Instead, it suggested that Quebecor reapply for a “Category 2” license or wait until the moratorium had passed. Claims about what a Category 1 license entails are all over the map. Some say it would force broadcasters to include it in the basic package, while according to others it would simply force them to offer it to subscribers who want it. "At the risk of stating the obvious, as long as the state controls radio and TV frequencies, we can look forward to more hysterical debates over political interference in the licensing process, subsidies for the CBC, alleged censorship, and media being shoved down our throats." The regulatory landscape is complex and it would take an expert in telecommunications law to explain what exactly are the conditions of each license category. But a quick glance at the CRTC’s list of Category 1 and 2 channels confirms that Category 1 is not a ticket to the basic package. (Hands up everyone who gets MTV2 and “ONE: the Body, Mind & Spirit Channel” in their basic line-up.) Anyhow, Quebecor did subsequently reapply for a Category 2 license, requesting “mandatory access” (but not “mandatory distribution”) for up to three years (the actual license application can be found here). So if the license is granted, broadcasters would have to offer Sun TV News to their subscribers for up to three years. Admittedly, the state shouldn’t be forcing them to offer anything, but this is not exactly the stuff of nightmares. So if their interpretation of license categories appears to be off and the initial application was rejected anyway, how do critics maintain the objection? The petition warns that CRTC chair Konrad von Finckenstein is in the Prime Minister’s crosshairs. The allegation is based on a Globe and Mail column by Lawrence Martin, which cited “insiders” in asserting that von Finckenstein was being offered “judgeships and ambassadorships” in an effort to replace him with “a rubber stamper” (who would presumably grant the Category 1 license). Of course, the way to avoid this problem in the first place is for the airwaves to be privately owned and for the state to have no role in apportioning them. But given von Finckenstein’s statement, which has reduced the critics to calling him a naïf, it’s hard to see what more there is to this story than pure speculation. Public broadcasting should show us the best of our own storytelling, news and entertainment, and do those tasks that private broadcasters balk at. To many Canadians, CBC-TV and radio have traditionally represented an oasis of good taste and common sense in a media world gone mad with celebrity coverage and other forms of mindless frivolity. The mind boggles at the brazen absence of logical consistency. How can the same person fume with rage over the possibility that the state might require carriers to offer a TV channel to their subscribers while simultaneously believing passionately in the need for Canadian taxpayers to be forced to subsidize another broadcaster to the tune (in 2009) of almost $1.1 billion! Free speech is deeply ingrained in Canadian political culture and even the most fervent critics are no doubt highly uncomfortable with the idea of censorship. But then one reads columns such as Linda McQuaig’s in the Toronto Star in which she closes with the words, “The media already blast Canadians with a steady chorus of right-wing ideas. A Fox-style network here – if Harper gets his way – would turn that into a deafening cacophony.” If she isn’t advocating that Sun TV News be kept off the airwaves, what is she advocating? Given the rather feeble nature of the objections to Sun TV News, to what extent is the criticism really being driven by an unspoken desire for censorship? They may not want to admit it to themselves, but it sounds like they would rather that the CRTC simply tell Quebecor to take a hike. At the risk of stating the obvious, as long as the state controls radio and TV frequencies, we can look forward to more hysterical debates over political interference in the licensing process, subsidies for the CBC, alleged censorship, and media being shoved down our throats. What if we were all free to decide what to broadcast and what to watch? What if state coercion played no role in broadcasting?